I had a hectic week last week. There were several meetings to attend as an interpreter, multiple deadlines to meet, and accidentally I missed my dentist appointment. I thought it was on Thursday, but it actually was on Wednesday. In English, you can describe this situation by saying, “I got the dates mixed up“. When you have so many different details to remember or think about, you may get confused. 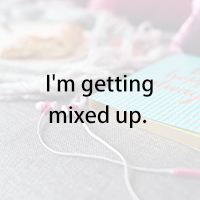 Instead of saying “I’m confused“, you can also say “I’m mixed up“. In real life conversations, you may hear slightly different variations. For example, I’m mixed up, I got mixed up, I’m all mixed up, or I got totally mixed up. When someone is explaining something complex, and you want to ask him to stop and repeat, you can say, “Wait, wait. I’m getting mixed up. Can you say that again?”. Next Post 訳わかんない – I’m confused.